For December we chose Get Well Soon by Jennifer Wright. 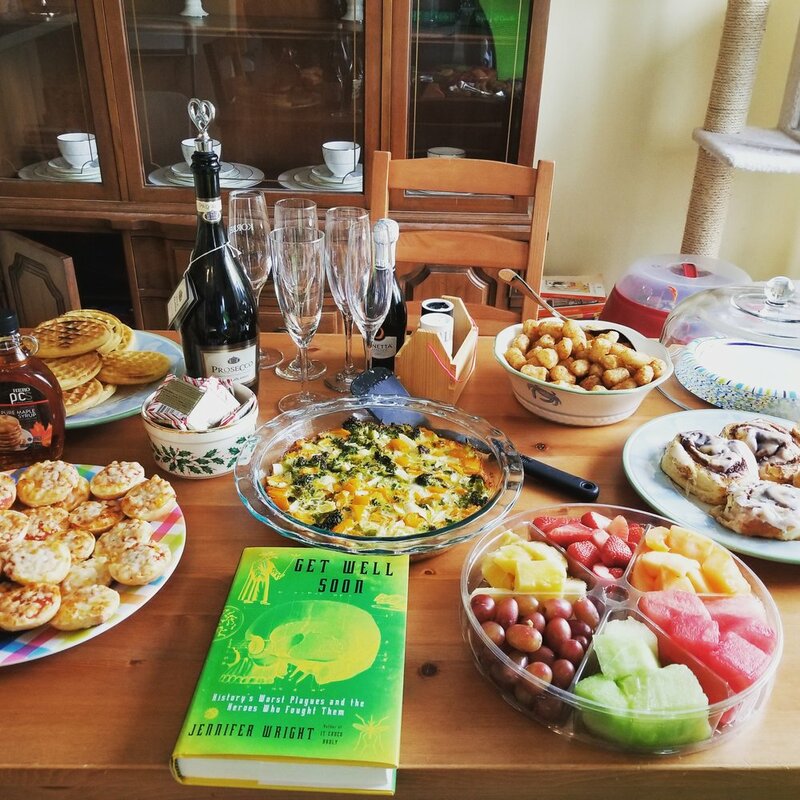 We had a vegetarian breakfast menu consisting of mimosas, broccoli quiche, slice fruit, waffles, bagel bites, tater tots and cinnamon rolls. I loved this book. At least once every chapter I would stop and read a paragraph aloud to my husband because I something I read was so thought-provoking or funny. I would recommend to anyone, and I typically prefer fiction. 1) In the introduction, Wright reminds readers that "people in the past thought they were living in the present." For many of us, this was an interesting point of view. How often are you drawn in by thinking people of the past aren't us three dimensional as now? 2) Do you feel we are ready for the next pandemic? What is the lesson from the book most applicable today? 3) What are your thoughts of the writing style? We were wishing Wright had a podcast! 5) We were all appalled at the lobotomy chapter. However, what medical practices we do today might be considered barbaric to people of the future? 6) One of the things Wright asks us to keep in mind while voting is would we want this person to lead us through a plague. Discuss. 7) We talked a lot about the AIDS chapter, and how terrible people were behaving fairly recently, and how we can be better in the future.